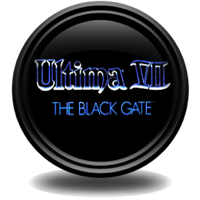 Ultima VII: The Black Gate is the first part of the seventh installment of the main series and was the tenth Ultima game to be released, including spin-offs. 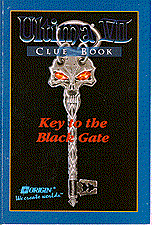 It was released and published by Origin in 1992. A port for SNES followed in 1994. This seventh chapter is the first story in the Age of Armageddon and, along with Serpent Isle, is widely considered to be the greatest of the entire series. Ultima VII continued where Ultima VI left off in technical development. Refining all the virtues of its predecessor, it pushed the envelope of contemporary PCs. The graphics employ the whole spectrum of 256-color VGA, the soundtrack is deep and atmospheric and digital recorded sound is used for the first time for the booming voice of the Guardian. The huge, seamless world with its overflow of details and intricate design are the high point of realism in the series. Character control is greatly streamlined, with every action able to be performed with the mouse. The inventory and battle systems are improved and dialogue input is no longer handled by typing keywords, but rather by selecting them from a list. The presentation and story have also become quite mature -- the player is confronted with graphic crime scenes, drug use, racism and political corruption. Furthermore, the Guardian uses a clever and subtle plot to assert his power over the land, rather unlike the comparatively one-dimensional villains of the earliest games. 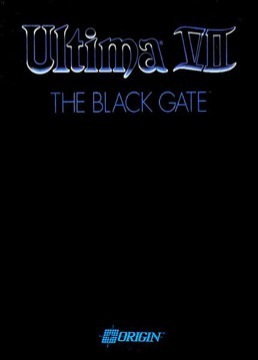 Ultima VII was a hit in 1992, but its sales weren't enough to prevent the necessity of a takeover by Electronic Arts later in the year (just after Underworld II was released). 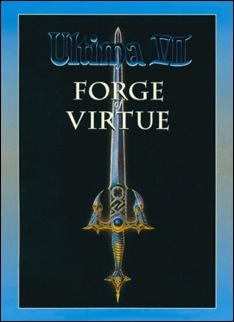 The Forge of Virtue was an add-on disk, published by Origin in 1992. With it installed, a totally new quest becomes available, which can be played at any time in the game. Today, it is included in the CD-ROM edition of Ultima VII, and one with the main program. The Isle of Fire rises from the sea at the beginning of the game and Lord British fears the worst: the return of Exodus the Destroyer. He sends the Avatar to determine the dangers. The Avatar has to master the tests of the three Principles, in doing so necessitating the forging of the Black Sword. At its conclusion, the interference of the mage Erethian is thwarted and the Dark Core of Exodus is banished to the Void to prevent the beast's return. With this done, Lord British declares the Avatar to be a real hero, and all stats are maximized. Included with it is the "Guide the Isle of Fire" pamphlet. ▪	Ultima VII is the last Ultima produced by Origin before the takeover by Electronic Arts. ▪	First time recorded sound is used in the series. In this case, to create the booming voice of the Guardian. ▪	Richard Garriott may have based the idea for the Fellowship on the Church of Scientology. The whole structure of the Fellowship, their mannerisms, language and secrecy, are a parody. ▪	The EA takeover is also referenced several times in the game. The Generators form the old cube-sphere-pyramid logo, and Elizabeth and Abraham stand for EA (short for Electronic Arts). The Guardian is called the Destroyer of Worlds, while Origin's motto was: "We create Worlds". The musical score was originally arranged and composed by Dana Glover, Marc Schaefgen, Raymond Benson, Kathleen Jones, Herman Miller, David Watson, Kirk Winterrowd for the IBM PC version. These tracks were played on a Roland MT32 and recored in digital format. Click on the lute to download the music files.